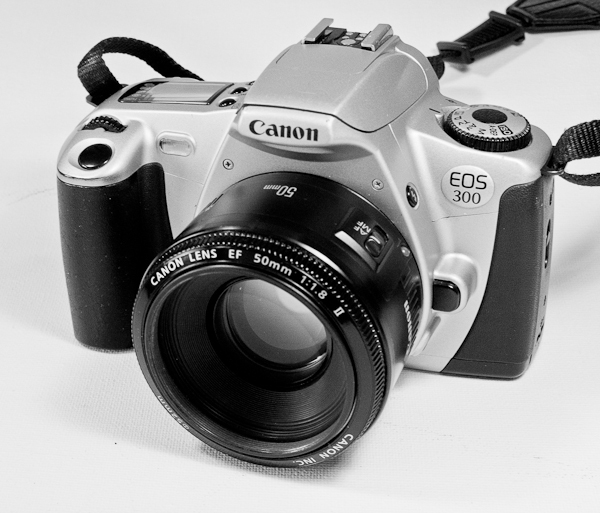 I’ve just bought this Canon EOS-300 (well, the body without the lens actually) for £4.99 including postage from eBay. An incredible price, and the seller gives a 14-day return guarantee. It’s a 35mm film SLR which was produced by Canon between 1999 and 2002. A very popular model, there’s always several for sale on eBay. The auto focus has seven selectable focus points. I know that later Canon cameras have about 35 selectable focus points rather than 7, but I reckon if you’re going to change the focus point you might as well just use manual focus anyway. The only feature I’d quite like, which it doesn’t have, is spot metering. If you’ve used one of the Canon digital cameras, then many of the features of the camera will be familair to you. Just don’t waste time looking for an LCD screen on the back ! This is the third EOS300 I’ve purchased, all second-hand. My first was purchased for about £45, complete with a 28-80mm kit lens. I may have just had a poor copy of the lens, but the image quality was pretty awful with that lens, which I later replaced with prime lenses – the Canon 50mm f.18 II (pictured on the camera above), a Sigma 24mm wide angle, and the Sigma 105mm f2.8 EX DG macro lens. That first EOS300 got swamped by a big wave at Whitby one wild November day (as did I). By the next day, when I’d dried myself out, the camera body had seized up. Now if the camera had been a modern digital SLR, costing somewhere between say £500 – £3000, I would have been pretty upset. At the very least my insurance premiums would be going up the next year. But this being a £45 second-hand purchase, I didn’t get too upset. I was able to buy a replacement body for £7.99 on eBay – although in this case the postage was another £7.99 on top. Anyway, back to the concept of the “backup” camera. That can mean a number of things. First, I can carry two of these, with different film types or speeds loaded. 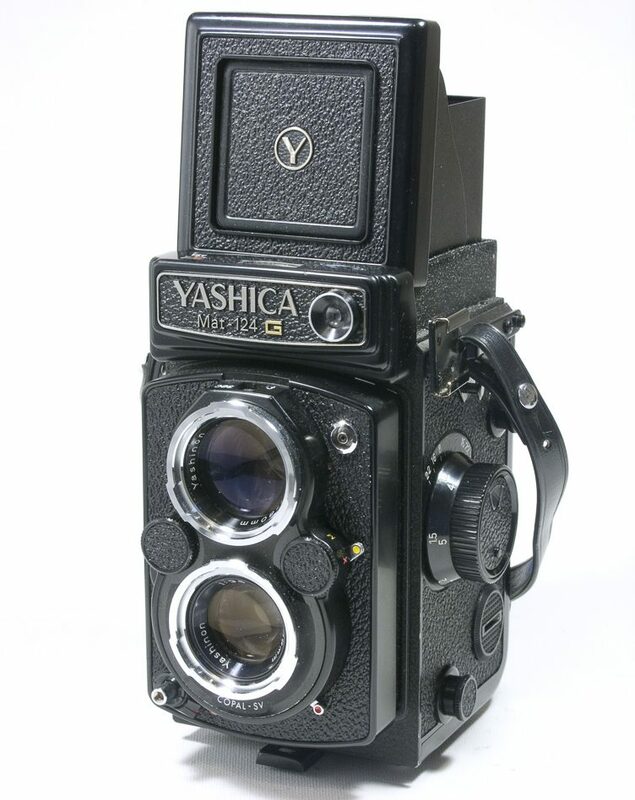 Second, I sometimes carry this camera, with the 105mm macro lens, as an accompaniment to a medium format kit, just to deal with any macro requirements that arise, as I don’t have a macro lens to fit my Mamiya RZ67. Third, photographers who use Canon digital SLRs and those lovely expensive “L” lenses, or any other Canon lenses in EF mount, might want to consider carrying an EOS300 body and a roll or two of film in their bag as a backup strategy, for those days when the digital camera gets swamped by a wave, dropped down a cliff, it’s batteries run out, the memory card fills up, or it refuses to switch on, or you can’t actually see the LCD in sunlight. Or maybe for those occasions when you really miss film. The light weight of the camera makes it a great choice for walking or cycling trips. I took one on a cycling tour of the Outer Hebrides, with just the 50mm and 24mm lenses, two graduated neutral density filters, and three slide films. Here are a few shots taken with the Canon EOS300. Next How’s your backup ? Great shots. I have a 33V (Elan 7N in North America) that I got for $30 Canadian. I am very impressed with its performance and find it makes a great companion to my Canon DSLR. It also will work with the older manual lenses that I like to use and which I think gave the slightly earlier versions in this series exposure problems that cannot be adjusted for.